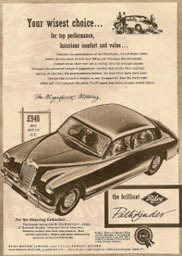 Below - how about 3 Brooklands for a total £605! Situations Vacant :- Wanted : Male assistant – a man with no encumbrances, prepared to have fidelity bond taken out. To help advertiser in any possible way. Must be able to do shorthand/typing, drive car, live in, any hours. If not prepared to rough it with me, do not apply. F.W. (Freddie) Dixon. 1 ½ litre 4-cyl. Riley Lynx 4-seater. This exceptionable example of the somewhat rare and economical 12/4 Lynx has covered rather more than 1,000 miles since the engine was reconditioned at a cost of approximately £85. Four tyres are as new. The very comprehensive all-weather equipment and overall tonneau cover have been little used. £295. Riley Big Four Flash 1938 CC (Close coupled) saloon. Four Light. Synchromesh and overdrive. This car cost £700 last year and close on £400 spent, mostly with Messrs. Rileys. this year when new engine and post-war 16-in. Wheels were fitted. Interior maroon hide. Original roof cloth. No faults of any description to declare. I will accept £355. This extremely potent little car, latterly owned by a world famous engine tuning specialist, is fitted with a 2 in. counterbalanced crank, latest type Ulster sump and large oil pump, large port head with 1 ½ in. S.U. carburetters, and four branch exhaust manifold. With a dry weight of 13 cwt. It is capable of around 90 m.p.h. with excellent road holding and braking. £295. RILEY NINE KESTREL, 1936. £145. Also 1934 Kestrel Nine. £80. Both special series. Cheshire. 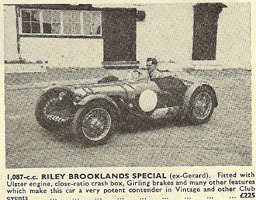 BROOKLANDS RILEY. Ex-Parry Thomas Railton prototype. Equipped for road use. First registered 1937. £150. London W10. 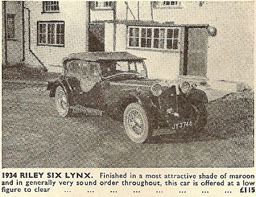 RILEY NINE LYNX. 1935 4-seater tourer. Cream. Attractive. Sound. £165 o.n.o. Rotherham. RILEY FALCON. 1935. One owner 16 years. Body and tyres very good. Mechanically sound. Numerous overhauls, king pins, pinion races, valves etc., just completed. £150. Rugby. RILEY NINE 1933 COUPE. Mechanically sound. Brakes relined, new carburetter and manifolds, new battery. £50. RILEY NINE KESTREL. 1934. Twin S.U.s, helical box, Sound and utterly reliable. £140. Will haggle but not much. Leicester. 1932 RILEY GAMECOCK. Resleeved, twin S.U.s, Good condition. £95. Hainault. 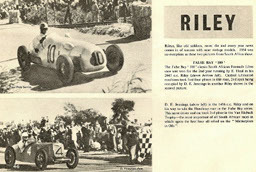 1934 RILEY NINE MONACO. All metal saloon. Good performance, economical. Good tyres, brakes relined. £90. Waltham St. Lawrence. 1938 RILEY KESTREL. 1 1/2. Rare model. Straight gearbox overdrive, low mileage. Recent overhaul. New tyres. Perfect condition. No, repeat, NO faults. £310. RILEY 1935, 12/4 FALCON. Engine reconditioned. £85, o.n.o. Sheffield. RILEY NINE 2 seater. Red body. Engine, paintwork, tyres, batteries in good condition. No hood. £100. Silverthorn. RILEY NINE MONACO saloon. Very sound, smart appearance. £75 o.n.o. Tudor. 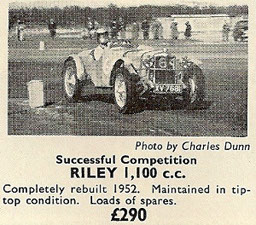 RILEY 1,089 c.c. 2 seater. Completely rebuilt 1952-3, fitted trailing link i.f.s. Tuned engine, preselector gearbox, new coachbuilt body, cellulosed B.R.G. Complete weather equipment, Concourse condition throughout. £200. Suffolk. RILEY enthusiast offers 1934 Monaco Nine and 1932 Gamecock - engines, accessories reconditioned, well shod, taxed/insured - 75 gns. each. Essex. RILEY NINE touring saloon. 1938. Overdrive, freewheel, special series engine, twin carbs. Original bores. Clutch needs attention, otherwise mechanically perfect. Body sound. Offers over £200. Birmingham. SOUND, 1933 RILEY NINE saloon. £95 or exchange for similar 2 seater. Derbyshire. £49.10s. 1932 RILEY NINE foursome drophead coupe. A pretty car in fair condition. Surrey. 1937 RILEY NINE MERLIN, special series engine, excellent condition throughout. £210. Leicester. 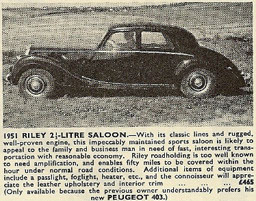 RILEY SPORTS SALOON. 1935, 12/4. Preselecta. One owner, new tyres, sleeved engine, replacement gearbox, overhauled transmission. £200. 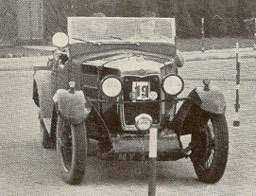 RILEY NINE TRINITY tourer. Excellent throughout. £100. Burgh Heath. £100. RILEY 12/4, 1935 Falcon saloon. Superb engine. New s/c gearbox, tyres, king pins,electrics. Taxed, insured. Bodywork reasonable. RILEY MENTONE saloon. Practical quality car, remarkable condition and value. £75. Stevenage. RILEY NINE, 1931 saloon. Mechanically perfect. Good tyres. £60. RILEY NINE tourer, 1931. £130 o.n.o.Hampshire. RILEY MONACO, 1933, really excellent, transmission overhauled, new c.w.p. sound engine, body beautiful. £130. Gladstone. 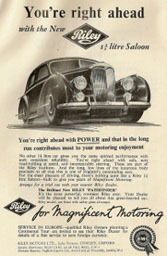 RILEY NINE saloon, 1934. Reconditioned engine. Bodywork reasonable. £80. Salisbury. 1936 RILEY NINE KESTREL. A fast, economical car in really first class mechanical condition. £150. Bristol. 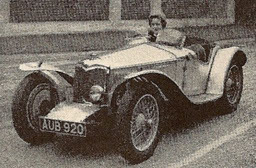 RILEY LINCOCK, 1933, 2/4 seater coupe. Finished off white. Smart example of unusual model. Good mechanically and good tyres. £135. London SW16. RILEY NINE LYNX 4 seater, 1934. Scintilla, Fram, twin S.U.s manual gearbox. Good tyres, 2 new spares. Perspex sidescreens. Best offer over £100. Birkenhead. RILEY, 1936 12/4 Merlin. Blue. New tyres, battery, radiator, etc. Excellent performance. £150. Laburnham. RILEY 1 1/2 LITRE LYNX 4 seater tourer. Mechanically perfect. Body immaculate. New hood, carpets, chrome work. Restored to absolutely new condition. Red interior, wheels, trim. £290. Swansea. RILEY NINE 1931 Monaco. Taxed year. Body sound, brakes relined, reconditioned dynamo etc. Reliable. £75. Springpark. RILEY 9-H.P. Biarritz saloon. Sound coachwork and mechanical condition. £75. London. RILEY NINE MARCH SPECIAL. 2/4 seater. Engine resleeved and new 1 11/16 in. crank fitted 4,000 miles ago. Scintilla Vertex. Helical gearbox. Bodywork faultless, resprayed Alfa red. All parts rechromed. Full weather equipment. Rewired and new batteries. £185. Sutton. 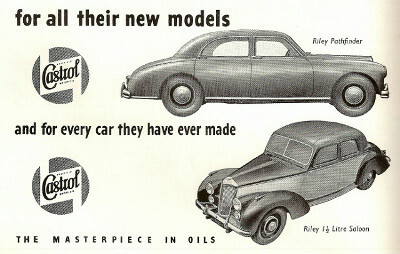 RILEY roadster, 1949: excellent condition: mileage 54,000 but new engine at 52,602: capable 100 miles per hour when run in. Colour red, with fawn upholstery: H.M.V. radio and windscreen washers. £850. RILEY NINE KESTREL (1933 special series). Quiet engine. New camshafts. Brakes relined. Good tyres, batteries. Mechanically perfect. Extremely rakish design that does not date. One owner over 18 years. Original instruments working. Original cellulose. Weybridge. RILEY MONACO, special series, late 1931, remarkable showroom condition, stored many years. Ace discs, mechanically perfect, six good tyres, chrome perfect, leather unmarked, altogether exceptional. £100. Middlesex. RILEY NINE, 2 seater special. Seven good tyres. Peculiar appearance but runs well. Taxed, insured. £45. RILEYS, 1936/7 Falcon Twelve h.c. pistons, etc., new tyres. £145. 1935 Kestrel Nine resprayed, relined. £125. 1933/4 Monaco Nine, good appearance, new tyres, battery. £80. Cardiff. RILEY NINE BIARRITZ, exceptional condition. Good tyres, new battery. In regular use. Taxed year. £90. Wordsworth. They say "Come to the specialists first"
1935 9-h.p. IMP 2 seater sports. £285. 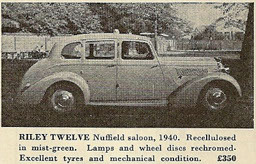 1937 12/4 Kestrel sports saloon. £295. 1936 G.H.P. KESTREL sports saloon. £240. 1935 12/4 FALCON sports saloon. £145. RILEY BIG FOUR, 1938 Adelphi, choice of 2. £225. RILEY KESTREL 1935 with new engine. £137 10s. 1936 RILEY 12/4 LYNX. £295. 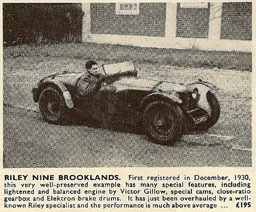 1937 RILEY 9 h.p. MONACO saloon. £235. 1936 RILEY 12/4 FALCON. £195. 1936 RILEY 12/4 SPRITE. £355. 1935 RILEY 9 h.p. IMP. £265. 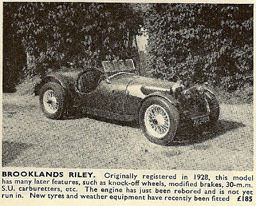 1933 RILEY 9 h.p. MONACO. £95. 1935 RILEY 12/4 KESTREL. £125.